Note: The four parts of Mr Coperthwaite are cyclical - one may watch the parts in any order, jump into the project at any time, and it is not necessary to have seen parts one or two before seeing this part. Film Love presents part three of Anna Grimshaw's year-long documentary project, about a singular figure in American culture. 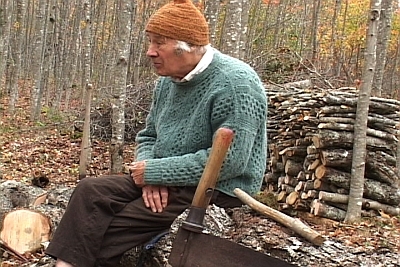 For the last fifty years, Bill Coperthwaite has lived and worked on 300 acres of wilderness in Machiasport, Maine – committed to what he calls "a handmade life." Over the course of one year, anthropologist and filmmaker Anna Grimshaw visited Coperthwaite each season, creating an intimate document of a remarkable person. Like Coperthwaite's life, Grimshaw's film is personal, handmade, and truly alternative. Instead of interviews, we simply observe the process of Coperthwaite's activity as it unfolds in time. Instead of a standard feature-length documentary, Mr Coperthwaite is in four parts of different lengths – one for each of the seasons. To reflect these alternate methods of living and cinema, Film Love presents each part of Mr Coperthwaite during the season which it depicts. Part three, Autumn's Work, premieres September 13, 2013 at Atlanta Contemporary Art Center. This screening is the world premiere, and Anna Grimshaw will be present to introduce the film and discuss her work. 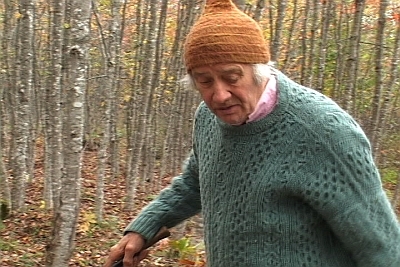 Akin to Henry David Thoreau, Autumn's Work finds Coperthwaite alone in the woods over several days, cutting up and removing a large fallen tree. The turning leaves and sudden breezes alert us to the passage of one season into another; meanwhile, counting the rings in the tree trunk, Coperthwaite observes that its age matches his own. As always, time – the real time of a task, the cinematic time of editing, the span of human and natural life, the eternal movement of the seasons – is the film’s underlying subject. But Autumn's Work is also deeply cinematic. Just as Coperthwaite struggles with the tree's massive trunk and stray branches, Grimshaw had to deal with the mass of video footage, editing it into a coherent whole. Both are "cutting" into time, whether the lines in the tree trunk or the video footage. Thus Grimshaw's filmmaking elegantly mirrors Coperthwaite's work on the land. As Coperthwaite's tree slowly comes apart, Grimshaw's film comes together, and Autumn's Work becomes an allegory of the creative and destructive cycle of the seasons, and of nature itself.